SSC CGL Tier-2 comprises of three sections namely English and Quantitative Aptitude followed by an optional paper for paper-3, you have to choose either from Statistics or General Studies. 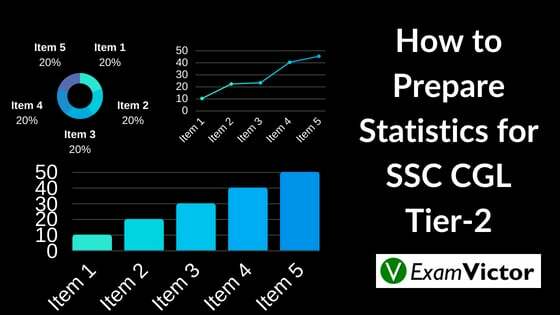 In this article, we are discussing the tips to prepare statistics for SSC CGL. This section comprises of 100 questions which are to be answered in 2 hours. Statistics is an extension of maths and the preparation of the Quantitative section will help you in this section as well. You can refer to the link for Preparation of Quantitative Aptitude for SSC CGL. Handling the primary and secondary data, methods of data collection, sorting the data, Tabulation of data, Graphs, Charts, Mean, Median, Mode, Common measure of dispersion and others. This section can also be started by taking up the school level maths book and solving the statistics section of class 10,11 and 12th. Statistics involves a lot of tabulation of data, accuracy and formulas. So besides practice, you need to put efforts in memorizing the formulas as well. Note down all the important formulas. The best method to ensure a high score in the statistics section is practice. Attempt practice questions of each topic. Solve the questions asked in the previous year's paper. Also, take some practice mock test papers which will help you clear all your doubts and increase speed. Ensure that you attempt around 60-65 questions with good accuracy to clear cut off marks easily. In this post, you get syllabus mentioned cleary and ways to prepare the whole syllabus smoothly. If you liked this article and want to know more about our SSC CGL Course then please click on the link given below.